This Pumpkin Cake with Caramel Cream Cheese Frosting is hands down, the best pumpkin cake recipe I’ve ever tried. 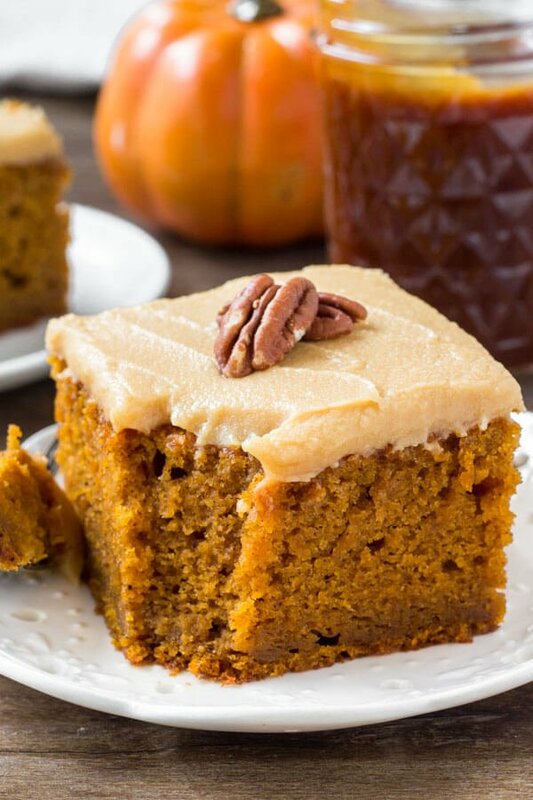 It’s moist, flavorful and filled with pumpkin spice. The frosting is sweet, creamy, slightly tangy & filled with caramel for the perfect flavor combo. Make it for Thanksgiving or whenever you’re craving a delicious pumpkin dessert. 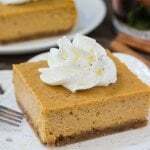 I keep thinking I’ve exhausted all the varieties of pumpkin desserts – and then I realize there’s a new pumpkin recipe I need to try. And today’s the day for a delicious new pumpkin creation. Enter pumpkin and caramel. 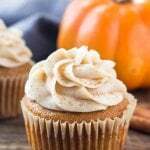 Because what could be better than flavorful, cinnamon filled pumpkin cake and sweet, slightly tangy caramel cream cheese frosting??? This pumpkin cake is moist, flavorful and has a deliciously tender crumb. What’s even better is that it’s basically made in 3 steps. Whisk together the dry ingredients: flour, baking powder, baking soda, pumpkin pie spice & salt. Beat together the oil, sugars, eggs, vanilla extract & pumpkin. Then beat the dry ingredients into the pumpkin mixture about 1/2 at a time. Then the pumpkin cake batter is ready to bake. Pour it into a greased and floured 9×13 inch pan, and bake for about 30-35 minutes. When it’s done – it shouldn’t wobble in the middle and an inserted toothpick will come out clean. The cake is soooo moist and tender thanks to the oil, eggs & pumpkin puree. 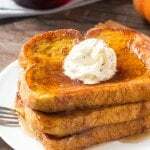 Then it’s packed with delicious pumpkin spice flavor because of the pumpkin, brown sugar, vanilla extract and pumpkin pie spice. I used 2 teaspoons of pumpkin pie spice because I wanted it to be mildly spiced. 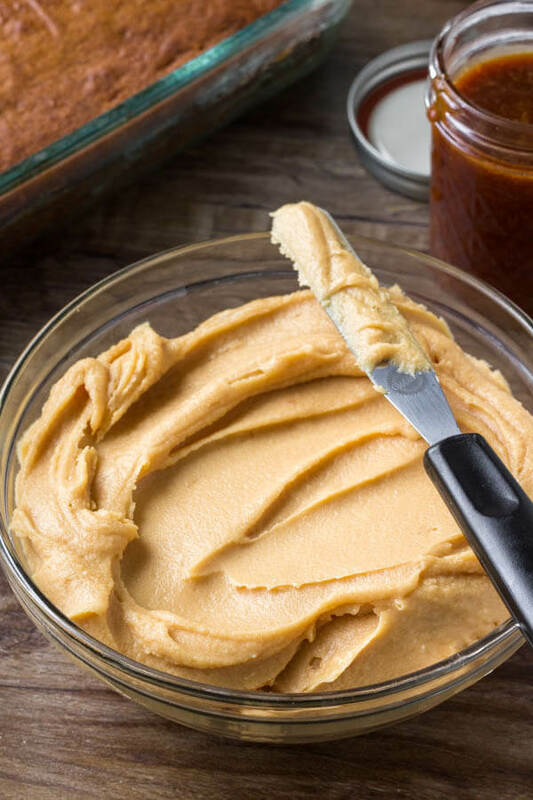 (We have lots of flavor from the caramel cream cheese frosting) – but feel free to use 1 tablespoon if you prefer the spice flavor to be a little stronger. And if you don’t have pumpkin pie spice on hand – you can make your own. Just check out the recipe notes. Ok – this caramel cream cheese icing just might be my new favorite thing. Normally caramel and caramel frosting are very sweet. But in this recipe, the tanginess of the cream cheese balances the sweet caramel perfectly. It’s creamy, slightly tangy, perfectly caramel-y and 100% delicious. First we make the salted caramel sauce. This recipe makes a salted caramel that’s a little thicker, which is perfect for making the frosting. If you want to save time, you can buy caramel sauce instead. Just make sure it’s a high-quality caramel that’s quite thick in consistency for the best flavor. From there, it’s super easy to make. Beat the butter until soft, then mix in the cream cheese. Mix in 1/2 of the powdered sugar, followed by the caramel. Then mix in the rest of the powdered sugar about 1/2 at a time until it’s sweet enough for you. If the frosting seems a little too thick or too sweet, mix in a heavy cream/whipping cream 1 tablespoon at a time. Frost the cake, and then you’re ready to serve. Sometimes I’ll top each slice with a few pecans or an extra drizzle of caramel sauce. Either way – this pumpkin cake with caramel cream cheese frosting is addictive. 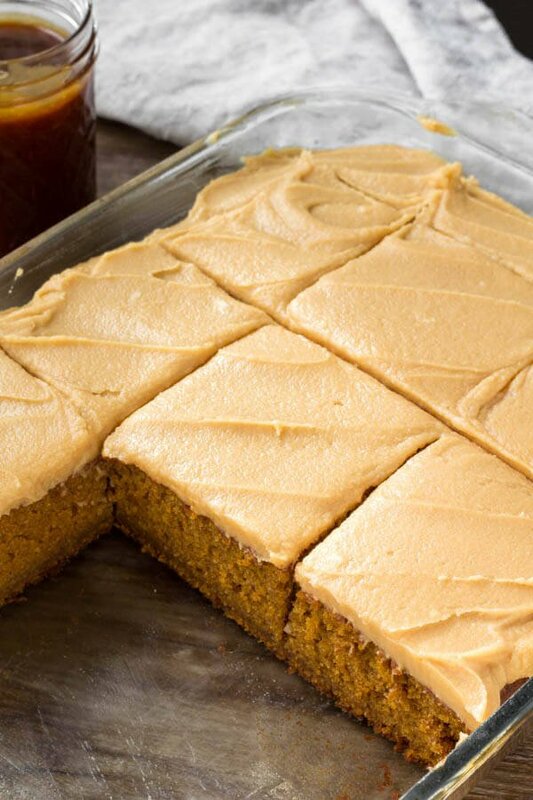 Moist, flavorful, packed with pumpkin and topped with the most delicious frosting imaginable. What could be better???? This Pumpkin Cake with Caramel Cream Cheese Frosting is hands down, the best pumpkin cake recipe I’ve ever tried. 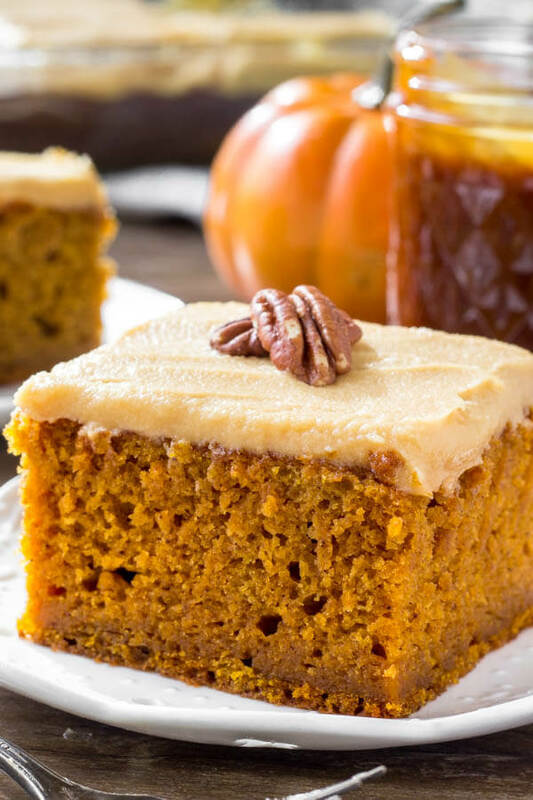 It’s moist, flavorful and filled with pumpkin spice. Preheat the oven to 350F degrees. Grease and flour a 9x13 inch pan. In a medium bowl whisk together the flour, pumpkin pie spice, baking powder, baking soda & salt. In a large bowl beat together the oil, sugars, eggs, vanilla extract and pumpkin puree until smooth. Beat in the flour mixture about 1/2 at a time, turning off the mixer and scraping down the sides of the bowl as necessary. Pour the batter into the prepared pan and bake for 35-40 minutes until it feels firm to the touch and inserted toothpick comes out clean. In a large bowl beat the butter until smooth. Mix in 1 1/2 cups powdered sugar, followed by the salted caramel. Mix in the rest of the powdered sugar about 1/2 cup at a time until it's the desired sweetness level you desire. If the mixture seems too thick or too sweet, beat in 1-2 tablespoons of whipping cream. Add the sugar to a large saucepan over medium heat. Whisk constantly as the sugar cooks. It will first form lumps and then turn into a deep colored amber sauce. Once it's completely smooth - whisk in the butter until it's fully melted. Then mix in the vanilla extract and salt.